One of the very first things you come to realise when you move to live in Italy is how deeply intertwined the past and the present are here. This is, after all, the country famous for its history, art and centuries-old buildings. Millions of people flock to it every month of every year seeking to experience for themselves the beauty and inspiration of Italy. If you are visiting for a limited time though, it is incredibly easy to overlook the fact that among all this abundance of ancient ruins, noble palaces, quirky villages and priceless works of art, actually, real people live real lives. As a visitor here you may suddenly feel like you have stepped onto a fantastical stage set up specifically for you to live your most romantic dreams. Everything is so colourful and exuberant. At times it even may feel like a perfect parallel world where the sun is always shining, the food always tastes good and people burst into a song every now and then, so full they are of the joy of life. Yet, Italy is not a mirage. And the rich heritage we, the short-term or long-term visitors here, love to enjoy, takes a lot of effort to be maintained and to be lived with and within. Just the other day, as I was running some errands in the centre of Vicenza, I came across a curious scene. Two men, standing upright in the basket of a mini portable lifting device, were busy clearing old leaves and other such debris from the statues adorning the facade of an old church. One of the men held a big plastic bag, already almost full, and both men were carefully picking up the rubbish and making sure that it all looked nice and tidy again. To be honest with you, I had a mini-revelation there and then. There are many beautiful churches and palazzi here in Vicenza and I have always taken it for granted that their facades look so nice and resplendent in the sun. Who would have thought that it takes a special group of people to regularly clean them? To actually go out there with a vehicle adapted to their particular needs and pick leaves off centuries-old statues in order to preserve them for many more decades and centuries to come? For a moment, I really wanted to be a fly on the wall during the meeting of the local authorities. Whereas other cities in other countries would be discussing the cleaning and maintenance of modern streets, which are straight and wide, of contemporary residential districts where everything has been designed with modern life in mind, I am sure that local councils all across Italy have a much more mind-boggling job to do. How about ensuring access for public transport through tiny curving streets which were built to allow for two horse carts to just about pass each other? Or making sure that the statues lining up the roof of a 17th-century palazzo get reinforced with steel brackets so that they keep staying upright after many years of exposure to the elements? Or, even, how to hang this year’s Christmas decorations on old UNESCO-heritage facades without damaging them? 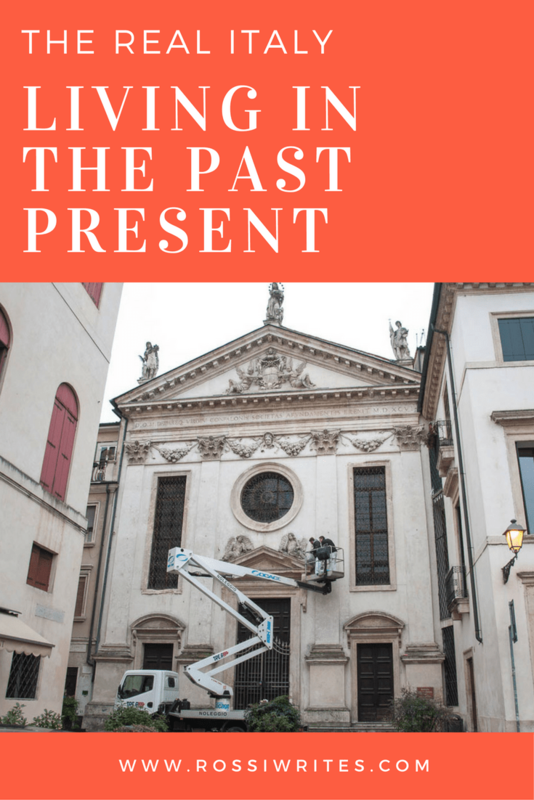 Just imagine the amount of planning and foresight that must go into making sure that the past is kept pristine, while at the same guaranteeing that both heritage and modern life can co- or even inter-exist. Based on what I have seen in the past two and a half years of my living in Italy, Italians seem to be very good at it. From the simplest to the most complex solutions, there seem to be ways to make both past and present live in harmony. Here are some of the most ingenious things I have seen here and which guarantee that the old can still be used alongside the new. It is a list based on my own little observations and discoveries, so it is not in any way exhaustive and, if you can add anything to it, I would love to hear it. Using tiny buses to navigate small and narrow medieval streets which otherwise would be inaccessible for public transport. Vicenza, for example, has a float of the cutest buses ever. They are about (I think) one-third or, even, one-quarter of the size of a normal bendy bus. Seeing one of these mini buses driving down a cobbled street is a very cute sight. Plus, using many other small-sized vehicles – from personal cars and tiny Vespas to actual mini delivery trucks. They can get trough the most labyrinthine historical town and it’s also really easy to find a place for them to park. Click here to see some pictures of the cutest Italian vehicles I have come across so far. Developing special firefighting techniques in order to ensure access to tall historical buildings with narrow staircases in case of fire. The scale italiane consist of four separate ladders which slot together and allow firefighters to quickly reach windows up to ten metres high. The most amazing thing about it though is that it doesn’t need to lean against a wall in order to stay upright. Click here to learn more about Italian firefighters and the tools they use to preserve Italy’s heritage. Old palaces are converted into flats as a way to breathe a new lease of life into them. Hence, there are construction companies specialised in the conversion, modernisation and maintenance of historical buildings which are centuries old. Just imagine having to connect to the grid or install the internet in a flat the walls of which are a meter thick. Or having to cut to measure the glass panes for intricate Venetian windows with pointy tops. Or having to make sure that in the course of the remodelling work, precious frescoes on the inside walls stay intact. Making sure that precious objects made centuries ago can still be used. A bit of an extravagant example, but prior to the advent of electricity, the lavish chandeliers made of Murano glass were designed to hold candles and not light bulbs. As such, the branches of the chandelier’s structure were solid rather than hollow as there were no wires to put through. So, how do you know if a Murano glass chandelier is really old rather than a modern make. I found out the answer from a real countess whilst on an organised tour of her villa on the outskirts of Vicenza. Apparently, the antique Murano glass chandeliers have their wires attached on the outside of their branches. The ubiquitous pro loco organisations relentlessly working to promote Italy’s towns and villages and preserve their unique identity. A pro loco (from Latin ‘in favour of a place’) is a grass-root organisation made up of local volunteers. They may promote a particular place, area and/or a product which is typical for it. Pro locos are behind the fabulous Italian sagre – celebrations of a foodstuff, a tradition or a village/town. Hence no matter how small a town or a village in Italy is, it has its own character rather than easily succumb to the uniformisation of modern life. And, lastly, I would like to mention the people who preserve the old Italian crafts and bring the old techniques of making things into our present, modern lives. You will see these artisans at medieval fairs across Italy, during market days and popular celebrations. They are often organised in associations – large and small – and are a source of knowledge about such amazing things like how coins were minted centuries ago, how swords were tempered, how furniture was carved from wood and even how paper was produced. Click here to read more about the craftsmen of Italy. So, yes, living in Italy, sooner or later you become aware of what a big part the past is of the present and how it is a constant uphill battle to preserve it. To preserve it from the elements, from the needs of our busy lives, from the effects of modern industries and from the destructive hands of time. When you come to Italy, no matter if it is going to be for a couple of days, months or years, try looking beyond the image which will charm your eyes. Try to lift the curtain a bit and delve into the intricacies involved in making the past still clicking and clocking, ticking and tocking today. This, no doubt, will enrich your experience even more. What do you love most about Italy? Its history? Its architecture? Its art? What do you think it takes to preserve the past as a living and breathing part of modern life?